Could A Lab Chip That Monitors Health Improve It? When it comes to technological innovations in the medical field, there is so much potential that may be untapped. Rutgers University researchers compiled a hypothesis to determine what would happen if a device or chip could monitor certain aspects of an individual's ever-changing health. Certain biomarkers show up via sweat or blood throughout the day and can show signs of specific health issues. Things like protein levels, exposure to bacteria and heart health can be readily read and available via a chip. The engineers at Rutgers university have invented biosensor technology that can be both handheld or wearable which will help to monitor various fluctuations in health in real time. Mehdi Javanmard, who is an assistant professor in the school's Department of Electrical and Computer Engineering, says this is really important in the context of personalized medicine or personalized health monitoring. 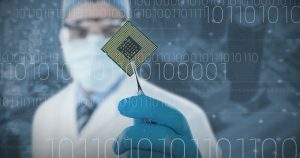 Our technology enables true labs on chips. We're talking about platforms the size of a USB flash drive or something that can be integrated onto an Apple Watch, for example, or a Fitbit. So the technology for the mechanisms to read such information is already present. The products mentioned above help to uncover things like activity level and heartbeat. A deeper, more integrated system would then be able to provide even more pertinent information about the state of our health, immune system, blood cell viability and so much more. The technology itself involves the electronic barcoding of micro-particles. Each barcode is used to identify them and is thus shown as disease and health shift indicators. This can be used for things like viruses and bacteria as well as specific air contaminants we may not even be aware of otherwise. Specific health indicators, things like DNA molecules or proteins, have been studied and better understood in recent decades. Those are incredibly complex molecular mechanisms that lead to many human illnesses and ailments. Many patterns and precursors have been uncovered that can be further ascertained by the testing of bodily fluids for a countless number of biomarkers. The way that biomarkers work is although one may be able to provide a bit of information, the information is often incomplete because the heterogeneous nature of specific diseases usually result in more than one indication. In order to get a more accurate diagnosis to better manage or prevent certain health issues, there is much benefit to being able to analyze multiple biomarkers at the same time. For example, there is a specific biomarker that tests for the antigens found in prostate cancer. For men who suffer from this cancer, having access to a chip that shows when the antigen first appears, would allow them to get treatment as soon as possible. This could really be the difference in positive prognosis and ultimately have a hand in saving lives. The electronic detection of these micro-particles makes it easy for smaller devices to give accurate readings. The researchers at Rutgers made the barcoding particles process much easier and smoother as the biosensors can now be small enough to be easily wearable. The accuracy of these tiny readers to find and identify biomarkers is over 95 percent. The additional fine tuning to get that number to 100 percent accuracy is consistently taking place.